A Retroreflective Tape (Fabric) returns the light flux back to its source and makes a person visible for the drivers in the headlight light. 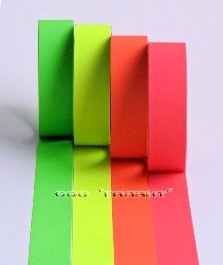 Tape (fabric) comes in several types: gray (silver), yellow, lemon yellow, orange, red and light green, 1-60 cm wide. Retroreflective Tape (Fabric) is used for marking people in the dark by becoming bright white in the headlight light or other source of light and providing more than 100 m visibility. Use of the Retroreflective Tape (Fabric) increases safety of drivers, miners, traffic patrol officers, emergency and rescue workers, railroaders, bikers and, especially, children at night.